When it comes to decorating a kid’s room, there are a plethora of ideas out there. The great thing about it is that you can completely let your imagination go wild. The more out of the box stuff you add, the more they will enjoy it. The only difficulty is knowing how to decorate the room. With all of the different designs you can choose from, it’s hard to know which one would be perfect for your child. 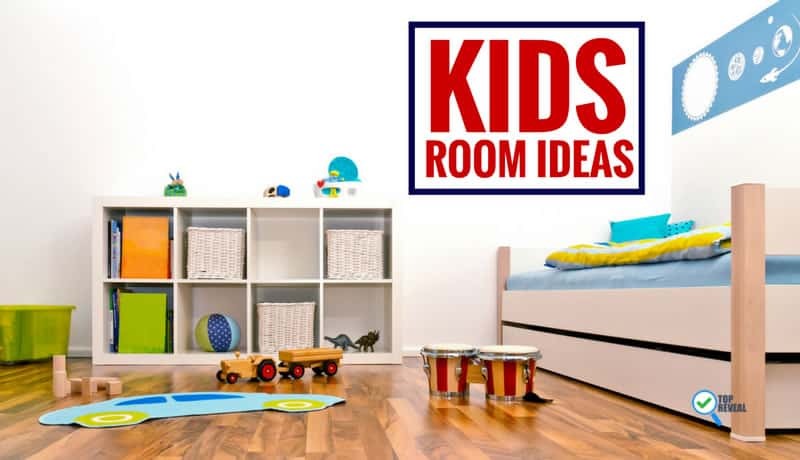 This thorough list of some of the best kids bedroom decor ideas will be sure to spark your imagination and help you decide how to remodel a room for your child. 11 Star Wars Room-Does it Get Any Better? If you have a kid that loves sports, then make their dreams come true with this room/ mini basketball court. Not only will it keep them entertained, but it’s a great way to expend energy on rainy days. A traveling theme is a great way to get your kid’s imagination running wild. With a room as decorated as this one, they can travel the world without having to leave the room. 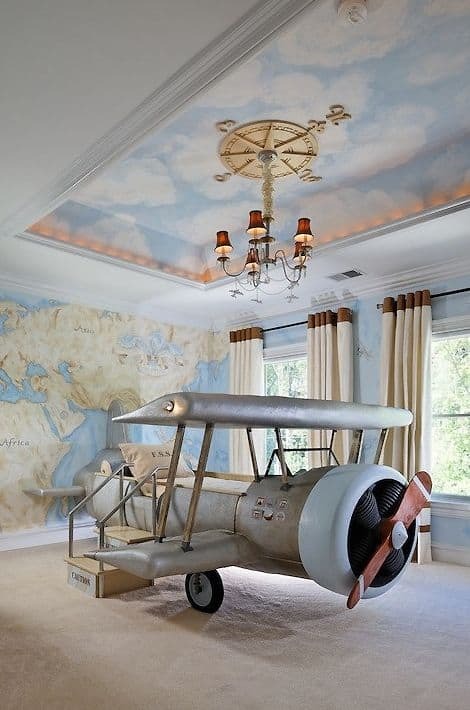 The propeller airplane bed really really brings the theme altogether. Click here for this design idea. This is a great room idea for a family that spends a lot of times outdoors. 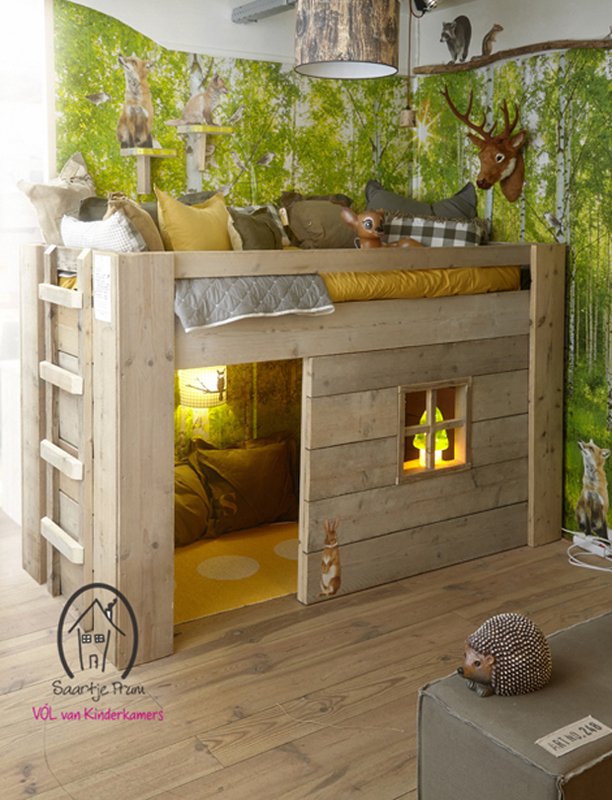 If you have a kid that loves being outside, then let him stay there with this woodsy room. The bed/ log cabin would be an instant hit, and the wallpaper makes it feel like their own personal forest. When you think of little girl’s room, the first detail that probably pops into your head is the color pink. But times have changed and it’s time to expand the horizons when it comes to decor. This room does have some pink, but the gray is the domineering color; and I think you’ll agree that it still looks as feminine as ever. 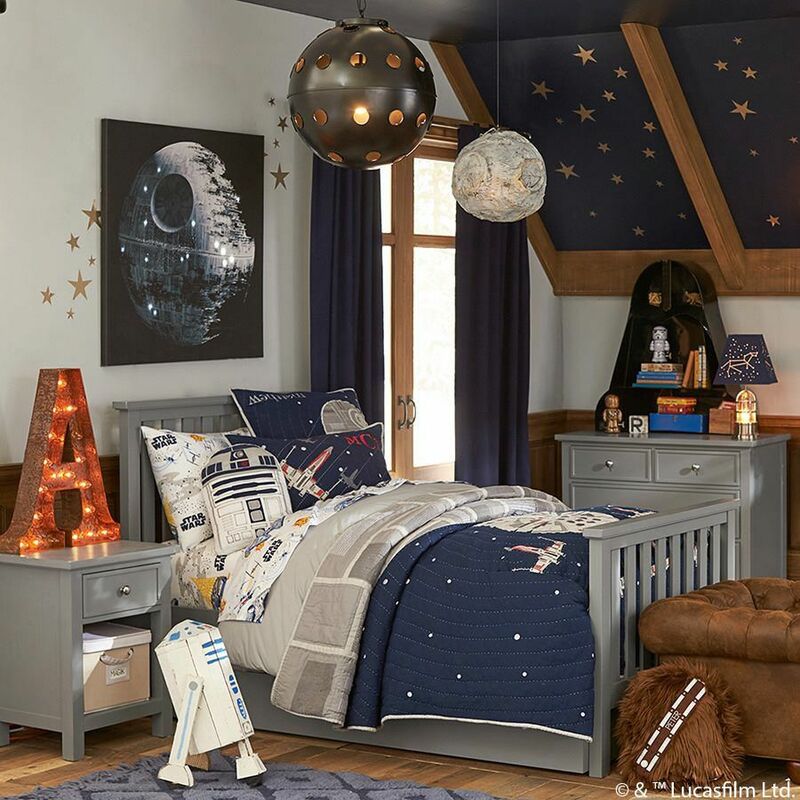 A space themed kids room is certainly not an original idea, but it will always be a great one, especially with the decorations you can find these days. A solar system ceiling is as cool as it gets, and the 3D planets really add to the realistic effect. Create an interactive galactic room for your child! Even better with a cooling fan in their room. Having multiple kids means equality with everything. Having bunk beds is just fine, and saves space, but sometimes there are arguments about the top and bottom bunk. For a shared room, this may be the best option. Each kid gets a side and their own personal space. This way, the decorating can be done by the children, leaving less work for you! Better clean up regularly as Kids rooms are hard to maintain in shape. Bohemian vintage is certainly not the first style you think of when designing a children’s room, but maybe it should be. This cute collection of decor is actually quite cozy. What makes this style so great is the fact that antique pieces are much cheaper than brand new furniture. This room is a DIY dream! Just because you’re cramped on space doesn’t mean you need to be cramped in style. There are lots of creative ways to make the most out of a small space. This idea is a great example of how to fit a bed with a fun environment into a smaller room. I think it’s safe to say that modern is the last style that should be in a kid’s room, but perhaps it should be considered. This room is made of clean lines and crisp corners, but the colors and designs still make it fun and welcoming. There are plenty of ways to add lots of color without looking too tacky. Stay away from the primary ones, and lean more towards pastels. That way, you can create a space like this, where there are plenty of visual stimulants without looking too unstylish. Legos are a toy that will never go out of style. So why not create a child’s room around them? With fun bright colors and a world of possibilities, you can’t go wrong with this design idea. You can use the trademark black design for steps, drawers and general decor. Star Wars Room-Does it Get Any Better? Star Wars has only grown in popularity in the past few years, so designing a children’s room around the theme makes perfect sense. There are so many ideas you can incorporate into the design as well. 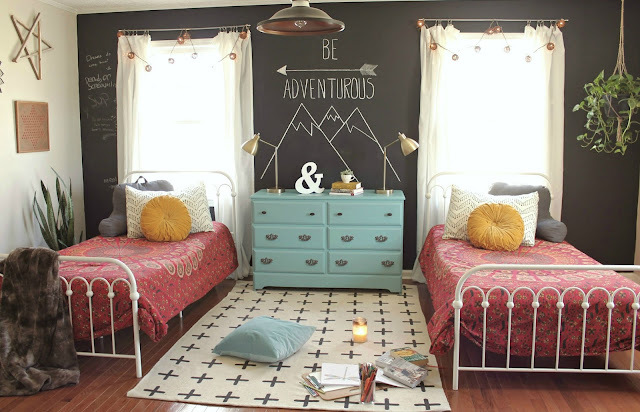 You can have as much fun decorating the room as your kid will having to play in it! I feel like there is always one child in every classroom that loves horses. If that kid is yours, then this is the perfect design example. What makes this room so special is that it still has everything horse themed while still staying classy. See Academiaeb.com for this design. With all of the Avengers and Justice League movies coming out, superheroes have really come back into the spotlight. 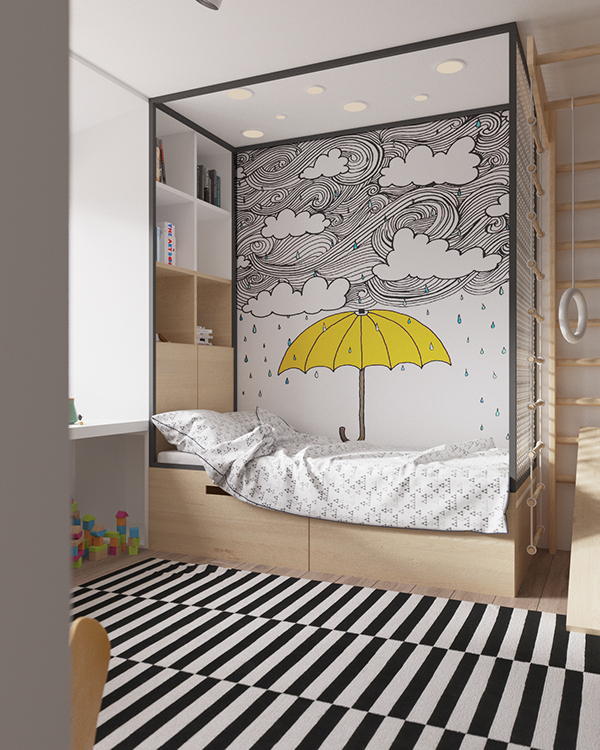 So if your kid is a fan of the movies or a die-hard comic book lover, consider creating a space like this. With so much popularity, finding things to decorate a room with will be a piece of cake and leave your child in awe. 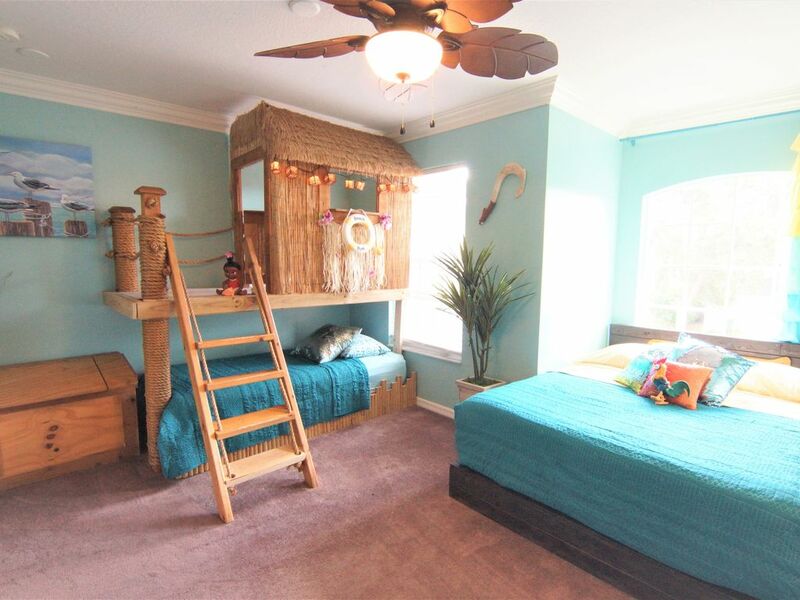 Creating a tropical themed bedroom for a child may seem silly, but is secretly brilliant. There are several Disney films that would match: Little Mermaid, Finding Nemo, and Moana. Incorporate one, or all three movies! You can easily turn this theme into a brilliant Disney one with a few simple touches. Click here for this design inspiration. 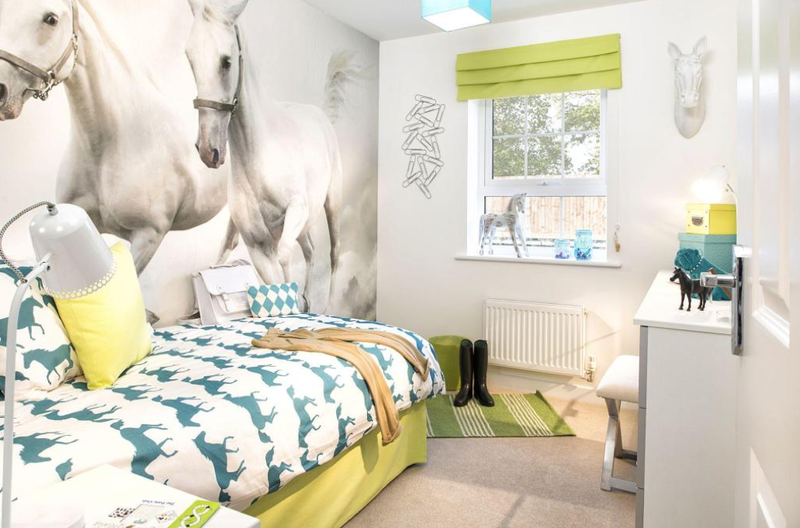 Make your daughter’s wish come true with this lovely little room that looks like it came straight out of a fairy tale. The soft colors and sheer curtains make the space seem nothing short of magical. The bed frame is the one thing that brings it all together perfectly. Jungle themes are a lot of fun to do. There are various ways you can go about decorating it, and you can decide how in depth you want to get. Some rooms have fake trees, thick vines coming from the ceiling, and beautiful murals. As you can see from the photo, the furniture and details are also adorable. When you hear nautical, usually you think of classy decor that one might find on a sailboat. But just imagine what a kid would think if they heard the same, and you have a great base for a nautical children’s room. 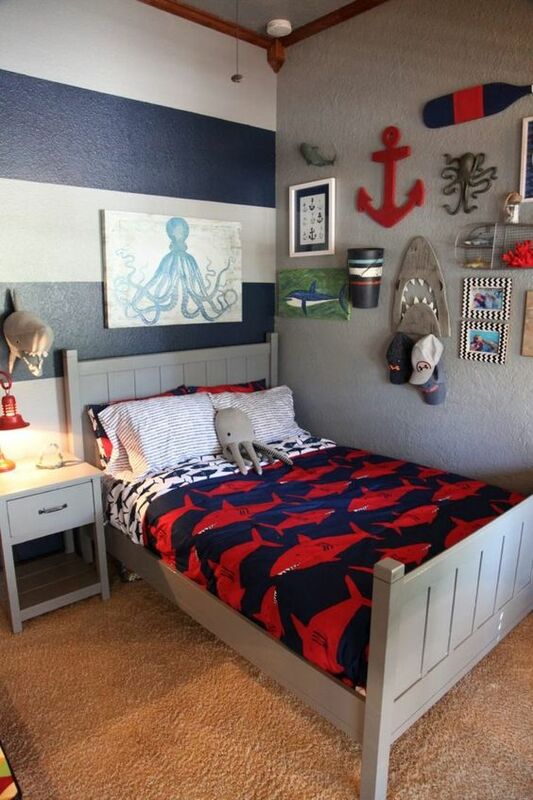 Complete the look with sharks and other sea creatures for a fun room under the sea. Rainbows may not be for everyone, but at least give it a thought before completely ruling it out. As this example shows, there are fun ways to incorporate rainbows (and unicorns of course!) into a bedroom without making it seem like too much. All you have to do is throw in a variety of colors on different objects around the room. Whether you are keeping your baby’s gender a secret or don’t feel like buying everything in blue or pink, this design is a great idea for any room. The natural colors are soothing, and can match with just about anything. Accents can range anywhere from the vibrant rug to the adorable foxes. If you want more decor possibilities, consider a gender-neutral design. Deciding on how to decorate your kid’s bedroom can be quite the challenge. But with so many great ideas out there, you’re sure to find something, no matter the gender or number of kids. 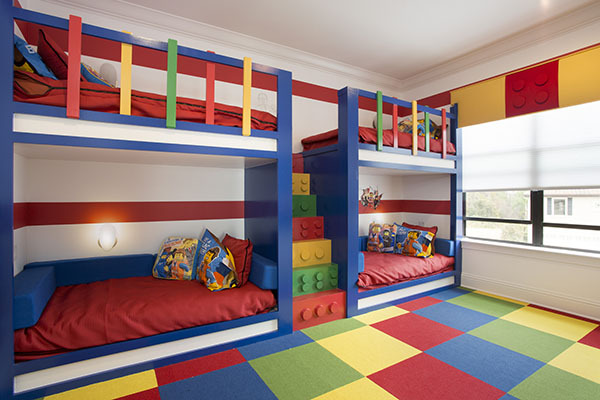 Hopefully, this list of some of the best kids bedroom ideas has been helpful to you. Please let us know what you thought! McCulloch MC1275 vs Dupray Neat Steam Cleaner Comparison: Which One is Better?